If you’re looking for a creatively charged environment to start your next company, check out this list of the top 10 cities for corporate innovation in North America. 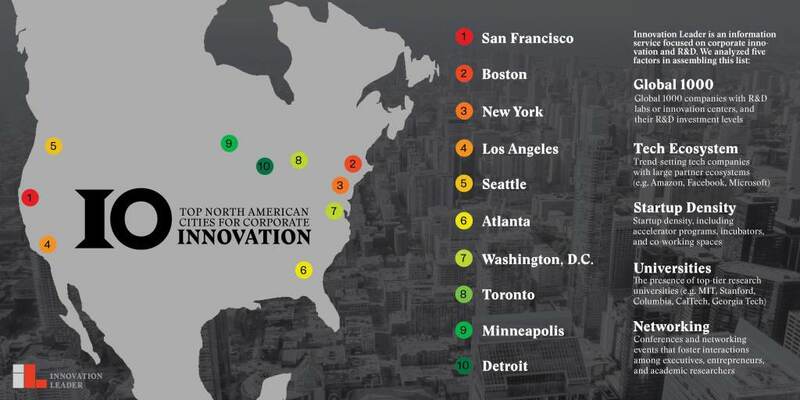 Innovation Leader, which, as the name implies, is a magazine and website focused on innovation in large companies, has just released its 2017 list of the top North American cities for corporate innovation. To make its determination, the magazine looked at not only startups and entrepreneurship, but also the amount of resources that big companies like Ford or Disney were dedicating to research-and-development and innovation activity in each citiy. The usual suspects top the list with San Francisco/San Jose, Calif. coming out on top (although that might change when Bachman leaves Silicon Valley) with Boston, New York, Los Angeles, and Seattle rounding out the top five. The bottom of the list highlights cities that aren’t typically associated with startup culture—Detroit, Minneapolis, and Toronto aka the Silicon Valley of Canada. 1. San Francisco-San Jose, Calif. The magazine also took a list at some up-and-coming cities whose resident businesses are making waves in the startup world. So if you prefer to spend your resources on engineers and app design instead of rent, consider starting your company in St. Louis or Cleveland.